Chimp-n-Sea project, vEcotourism.org, recently reported on an article from Lucy Radford, Development Officer at Barbary Macaque Awareness & Conservation which provides a moving account of her trek through fragmented forest in Langkat, North Sumatra. Supported by stunning photography from wildlife photographer Andrew Walmsley, Lucy outlines the plight of wildlife that is being squeezed into smaller and smaller areas as oil palm plantations continue to consume habitable forest. 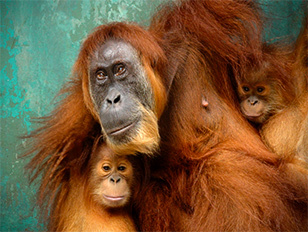 So much so that organisations such as the Sumatran Orangutan Society are being forced to relocate orangutans out of forest fragments to safer areas. Travel through the forests of Langkat, North Sumatra with Lucy and Andrew and find out how it is possible for a forest to no longer be a forest. Read the full article here. You can take an immersive and interactive vEcotour, created by vEcotourism.org, in Sumatra with expert guide, Ian Redmond, by clicking here!